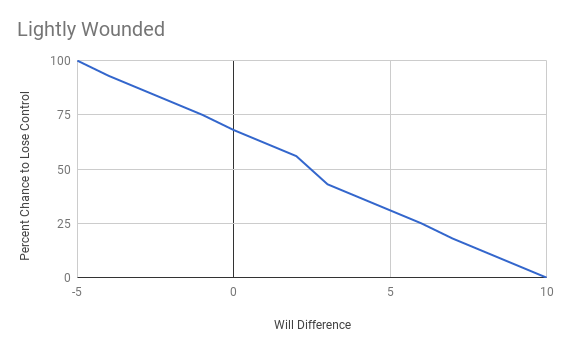 So, basically it looks kind of like a linear scaled chance to lose control based on your will difference. 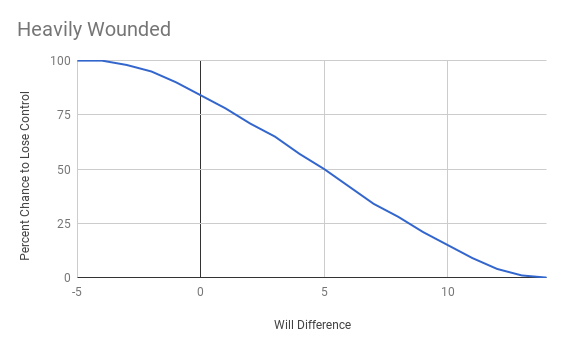 There’s a slight S curve to the line, more pronounced when heavily wounded which is not surprising given the bell curve of the dice being rolled. The slope also decreases for heavily wounded, with a complete spread from -5 to 15 will difference as opposed to the -5 to 10 of being lightly wounded. For my own purposes, it’s very tempting to focus in on that second chart. It very conveniently covers a 20 point will difference spread, and I’d like nothing more than to boil this whole thing down into a single roll of a d20. I think we can perhaps generalize this by using the heavily wounded chart as a base and then simply shifting it to the right if you are lightly wounded or unwounded. 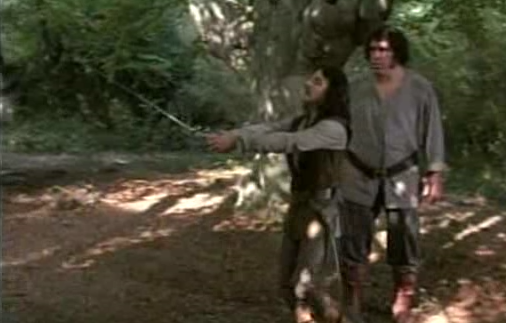 Roll d20 + Will Modifier + Wound Modifier >= 20 to retain control of the sword.